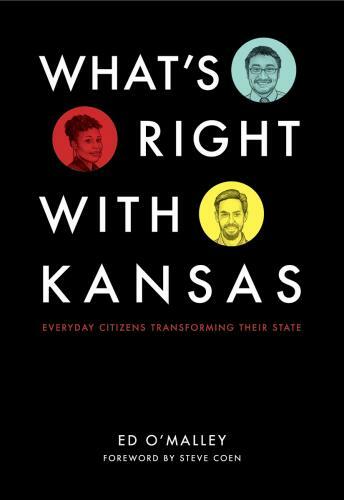 At a time when so much in civic life is disheartening, "What’s Right with Kansas" gives hope for a better tomorrow, created not by civic elites but by committed citizens. "What’s Right with Kansas" tells the real-life stories of dozens of Kansans who demonstrate principles taught at the Kansas Leadership Center that anyone can use to make progress on what we care most about in our communities. Ed O’Malley is the founding president and CEO of the Kansas Leadership Center. A former state legislator and gubernatorial aide, Ed started the center in 2007. Ed is a proud graduate of Kansas State University and bleeds purple with his Wildcats in all sports. On summer evenings, Ed can often be found in a well-worn powder blue ball cap, cheering on his beloved Kansas City Royals. On the personal side, Ed’s an avid runner. He’s participated in several marathons and a couple of what he refers to as “ill-advised” ultramarathons. Ed is married to his childhood sweetheart, Joanna, whom he met on a school bus in the seventh grade. They are the parents of three children: Kate, Jack and Lizzie.